Last weekend I bought a relatively new product in the Giant Foods universe: a whoopie pie. I had never seen one at Giant until September. I never bothered to try one of theirs, but whoopie pies and Baltimore have had an extremely brief courtship (unless they've been around all along and only now has someone let me in on the joke). I am starting to like these things: soft mound of cake on top of another one, with a sweet, lardy frosting in the middle that is clearly on the buttercream side of the buttercream-Bettercreme spectrum, thankfully as far away from "Bettercreme" as you could hope for. Man, I hate that stuff. Not long before this, I decided to put to test which was better, the moon pie or the whoopie pie. Although moon pies can be found all over the country (to my knowledge), they originate in Chattanooga and are common throughout the South. The relative shape is the only thing it really shares in common with the whoopie pie, made up of very different components: two soft graham craker cookies (more if you have the double decker variety) sandwiching a thick layer of marshmallow, and dipped in chocolate, vanilla, strawberry or banana (the banana tastes like death. It's not a favorite). Whoopie pies are specifically found in New England and the Pennsylvania Dutch communities, but are spreading to other parts of the country. Still they proudly remain a quintessentially Yankee dessert. Until recently, Maryland was solidly part of the "Moon Pie Belt." I grew up with moon pies. I had never heard of whoopie pies until a few years ago, and had never even seen much less eaten one until this summer. Before that, I thought it was just some sort of moon pie. But whoopie pies are becoming much more common in Maryland, and so the time is now right to test one against the other. 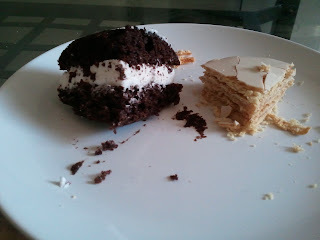 I quartered each pie, and taste tested a 1/4 moon pie vs a 1/4 whoopie pie. The moon pie was, as usual, a bit crumbly, though the flavor of the graham cracker crust and the surrounding robe of chocolate made up for that. As I realized, one of the best things about a moon pie is the contrast in textures between the brittle soft crumbliness of the graham crackers and the thick soft sponginess of the marshmallow (wow, that sounds pretentious). That, for me, is my favorite part of the moon pie. It's not the most natural thing you can find in the stores - the high fructose corn syrup is a good reason to not eat too many of them. Perhaps there's a way to make a healthier version, if there is such a thing as a "healthy" moon pie? Whole Foods' spongy whoopie is only one of three different types of whoopie pie I have eaten - the other being the thick and cakey devil's food Trader Joe's brand and the soft, "average and dependable just like everything else their bakery makes" kind from Giant. Each type tastes and feels fundamentally different from the others. Although Whole Foods' pie is probably the healthiest (or least unhealthy) of the three, it doesn't fare well in my opinion against the moon pie. While the creme filling of each kind is wonderful, the cake part of the Whole Foods variety leaves a funny taste in my mouth, and actually manages to make a typically messy dessert even messier. It so thoroughly coats the fingers that I found myself eating the Whole Foods' whoopie pie with a fork. The moon pie doesn't do that. 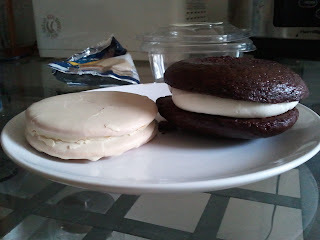 Verdict - Although I am really loving these whoopie pies, I liked the moon pie just a little better. 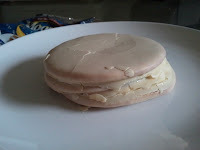 Granted, it might be different had I used a Trader Joe's or even a Giant Foods whoopie pie, both of which I liked a lot better than the Whole Foods kind. I'm still not sure which tastes closer to the traditional whoopie pie as most New Englanders and Amish know them. 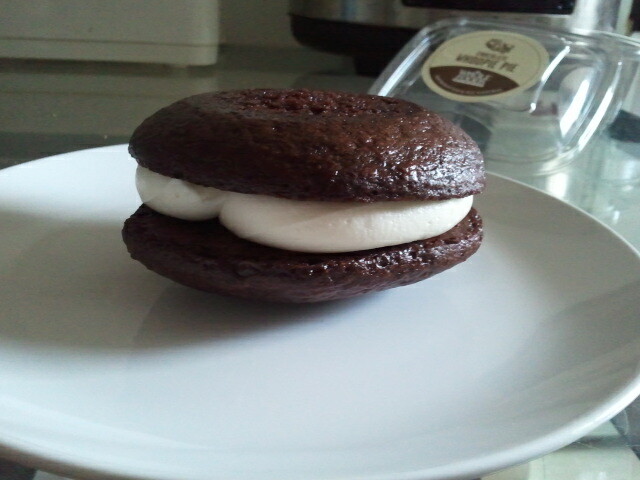 As for the marshmallowy chewiness of the moon pie, it does hold up well against the Whole Foods whoopie pie. Perhaps the moon pie would not do too well against the TJ or Giant ones, but that's for another taste test. So the final verdict: moon pie by a nose, though that totally hinges on the type of whoopie pie it is compared against. I grew up just north of Baltimore in PA Dutch country. Never had a moon pie, but the Dutch have lots of recipes for whoopie pies - the cake's pretty much the same everywhere, but the cream can vary as much as the Dunkin' Donuts types - from Eggy to Buttery to Sugary. I like eggy myself, just like Gramma's. To add to your research, you should try the Whoopie Pie at the Pennsylvania Dutch Market on York Road in Timonium! I've also seen a crazy Whoopie Pie-ish sort of treat in the bakery section of Wegman's, it was HUGE!!!!! My husband loves them. Could you also provide the BEST Moon Pie recipe ,closest to what we would eat that is commercially produced OR what is closest to what they are supposed to be non-commercially? I have looked and tried a few recipes but the cookies are too hard and the advised chocolate covering is always "straight semi-sweet chocolate" - too sweet.IMHO the cookies should be just hard enough to support the filling but soft enough to crumble with a soft bit.... I have the marshmallow recipe(hint:a food-tv guy who includes science in his show) that I like and is easy. I tried but couldn't really find any good recipes for moon pies. I just threw my hands up and decided to stick with the commercial ones. The ones I did find didn't get very close. I hadn't seen Alton's recipe.